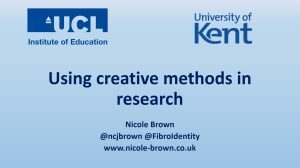 These are the slides for a workshop that is designed to support early career researchers with finding relevant methods for their qualitative research. Instead of focusing on interviews only, this workshop offers a variety of activities to be carried out on a one-to-one basis or in focus groups. The overall aim of this workshop is to explore creativity within research and to identify opportunities to use creative methods within the research process. In this interactive workshop we will explore what creativity is, why we should be creative in our PhD research and how we can introduce creativity and creative methods in our existing paradigms and methods. Participants will be actively experimenting with “pick a card” and “diamond 9” activities, photo elicitation, and the process of building models and creating representations. These activities and methods have been found particularly helpful in yielding rich qualitative data and thus provide a deeper insight into research participants’ experiences.